Designed to be held, the Buddha Bowl's ergonomic shape fits comfortably in your hand. Eat or drink easily on the couch or at your office. Use it for soup, salad, pasta, rice dishes, ice cream, or even coffee. Fun colors and sophisticated style make this bowl an instant favorite. Received exactly as pictured and in a very timely manner!! Very pleased! Although I bought this as a present which hasn't been received yet, I would love to get these bowls myself. They are great! This is the coolest bowl. I have to fight off my daughters and grandkids from using it! Get your own! Great design, easy to hold. As much as we’d like to eat at the table, it doesn’t always happen. Thankfully, the shape of Buddha Bowl’s Japanese-inspired designs are comfortable to hold, whether eating lunch at your desk or watching a movie on the couch. Founder Élan McPherson created her original Buddha Bowl for her arthritic grandmother. Its ergonomic curves make it easy to grip and hold onto without needing to set it on a table. The Udon Noodle Bowl is a way to enjoy ramen and noodles—it even has slots to rest chopsticks between bites. 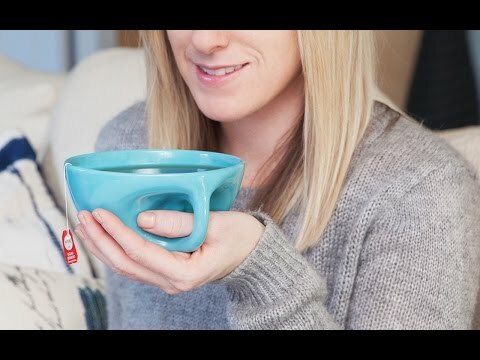 Handmade in the USA and Canada, these over-sized bowls are dishwasher and microwave safe. They’d even make a great gift for college students who eat in their dorms. And there’s no limit to what meals you can enjoy—salad, rice, mac & cheese, ice cream, or an XL cup of coffee in the morning. Whatever you use these bowls for, you’ll eat or drink comfortably.